For Hollywood’s latest remake of A Star is Born, the titular character, Ally, played by pop star, Lady Gaga has her pivotal, starmaking moment the old-fashioned way, belting out a tune to a live, appreciative audience. If A Star is Born were to be made to reflect Nigeria’s contemporary pop scene, perhaps Ally would have been discovered doing a fantastic cover on Instagram maybe. Or maybe on Snapchat or Facebook Live doing something incredibly funny. The internet is democratic and virality cannot be contained. There is no accounting the number of stars who have found fame and fortune trying out their luck on the interwebs. From rappers and pop singers to comedians and dancers, social media is an equal opportunity enabler. After establishing their stardom in their chosen spaces, mostly by hitting north of 1 million follows on social media platforms, what do these internet sensations usually do next? What typically starts as cameo roles in films like Alakada Reloaded or Lagos Real Fake Life soon blossoms into full-on starring and producing gigs in titles such as The Call, the production debut of comedian Woli Arole, real name Oluwatoyin Bayegun. 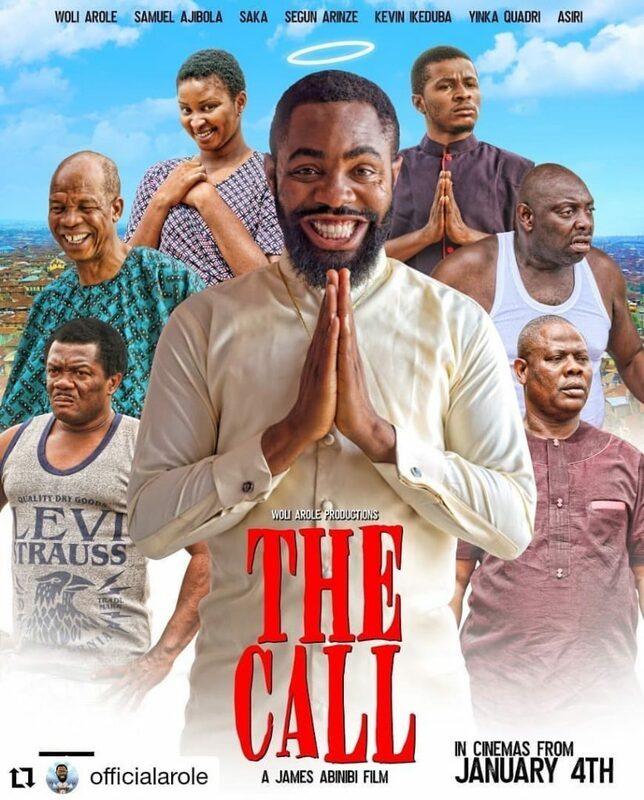 The Call isn’t a proper film as much as it is a longer form expression of Woli Arole’s basic shtick, an unnecessary stretching of space and resources to accommodate his viral social media skits into longer-form storytelling. But why a feature-length film and not a comedy special? The gag may be that this type of shoddily executed play for quick gains lends itself more to the anonymity of the theatre than the unforgiving glare of a live audience. Arole plays himself as a neighborhood bumpkin who is of no use to his eternally frustrated bicycle repairman father (Hafiz Oyetoro). His days are spent idling away with his friends, hurrying from one harebrained get rich quick scheme after the other and frittering the small gains on village maidens. One day Arole receives a call he believes is from God. He develops the ability to consider people around him and predict- for better or for worse- upcoming events in their lives. He has little choice but to heed this call, especially when it seems like this could be his ticket out of poverty. Together with his sidekick played by Samuel Ajibola, Arole embarks on an adventure that will have him encounter all sorts of people with various needs. A local union boss, silly teenage girls and desperate, man hunting older women, Arole’s new found ministry isn’t a discriminatory one. Naturally, Arole soon lands himself in local trouble and will require his wits, his talent as well as incredible levels of coincidence plus the grace of God (of course) to arrive at an ending that will reward persons who put their money and time into coming to see Arole headline his own film. Directed by James Abinibi who has worked with Arole in 2017’s Mentally, The Call is prepared to appeal to persons who are already fans of Arole. These people already know what they are going in for and will be rewarded handsomely, even if it is stuff they have gleaned in bits and pieces from his prior comic acts. Plenty jokes are lifted directly from pop culture references and if we are being honest, are more misses than hits. The Call is the kind of film that Nollywood producers spent the bulk of 2018 making, microwaved pieces of comic banality. December arrived with the promise of diversity and a hope that maybe things were somehow turning for the better. Turns out they aren’t. The Call is opening the new year’s box office report and while it will have its supporters, hopefully, films like this become the exception rather than the rule. A poor, underwhelmed critic can wish, right?